Homero holds a MSc in Geo-information and Remote Sensing applied to Natural Resources Managements and Environmental Modelling (with distinction) obtained from both the University of Southampton and the University of Twente (The Netherlands) and a BSc in Geography and Development from the Pontificia Universidad Católica del Ecuador. 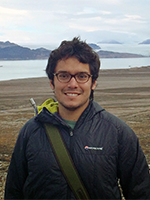 After completing his MSc Homero worked at the University of Southampton as researcher finding links between Arctic terrestrial hydrology and greenhouse fluxes. Later he worked at the Instituto of Geograf�a of the Universidad San Francisco de Quito (Ecuador) looking for spatial and quantitative methods to better understand the complex interactions between natural resources, economical activities and the history of cultural dynamics in sensitive areas such as the Galapagos Islands, the Amazon Rainforest and Andean communities. His professional experience includes the participation in the spatial and hydrological components of the planning of Quito(Ecuador) future water supplies. Also, Homero developed the strategies to increase the capacity of the Ecuadorian judicial service via development of conceptual, numerical and spatial models of the national judiciary system. Additional experience is related to several international projects in the energy and oil sectors. The aim of my current PhD is the identification and characterization of global areas where freshwater is more sensitive to variations in climate. This leads to the estimation of the way by which shifts in climate alters river catchment dynamics and in turn changes the frequency and intensity of hydrological extremes. This is done via the development of a hydrological framework where we try to understand the components that drive global freshwater processes and how this would respond to disturbances in the climate. In particular, using a land surface model and several spatial dataset we are looking at the sensitivity of precipitation, snowpack size, soil moisture content and generated runoff to different climate conditions. Additionally, a river hydrological model is incorporated to the framework in order to estimate the response of river flow and floodplain dynamics to these changes. Findings of my research will lead to the detection of global areas where its water sources and dynamics are responding more rapid and severe in a changing climate. Outputs generated of my research are essential to generate climate change adaptation, enhance the plan of hydrological risks and provide insights to water resources managers. This research is also developed in collaboration with the NASA's Jet Propulsion Laboratory.